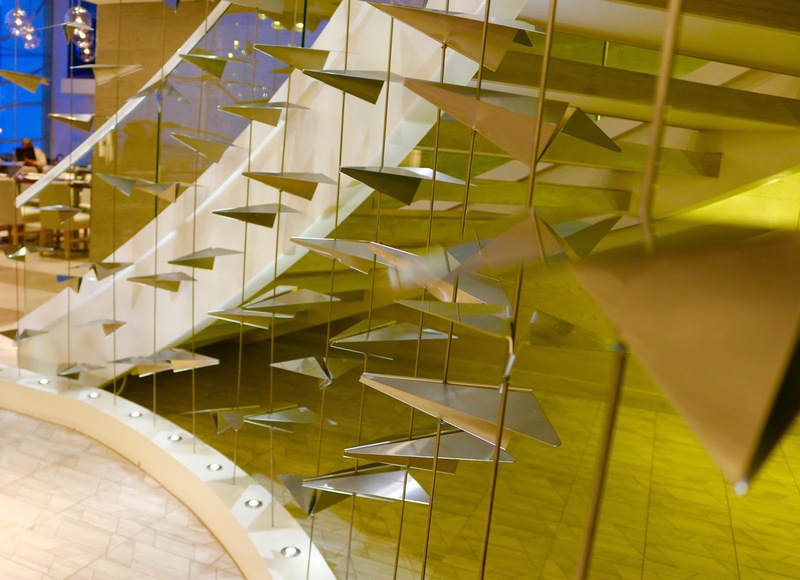 The renovated Hemisphere restaurant at the Hyatt Orlando Airport screams modern and comfortable - but not just in the "wow" design. The menu reflects the current dining trend: small plates that are shareable over great conversation and even better cocktails. But these are not your typical small plates. After working in several different cities across the U.S., executive chef Jeff Powell and Sous Chef Jason bring completely original and flavorful dishes to the new menu. For example, the Chef's Signature Pork Belly is unlike any pork belly dish I have had, and the pork belly itself is probably the best one I have had. It is served with succulent slow-pickled blueberries, a sun choke puree and candied jalapenos. Another revelation was the Avocado Toast, which again, is unlike any other avocado toast dish. The sweeter tomato jam complements and contrasts the avocado toast nicely - as does the radish and tangy queso fresco. We also tried the most unique Haricot Verts (green beans), which have a delicious earthiness from nduja spicy Italian salumi, and sauteed red onions. It is served with a sunny side up organic egg - a perfect complement to this dish! We also loved the Soft Shell Crab dish, which is served with fried green tomato, boursin grits and arugula salad. Both the crab and tomato were perfectly breaded and fried and so flavorful! 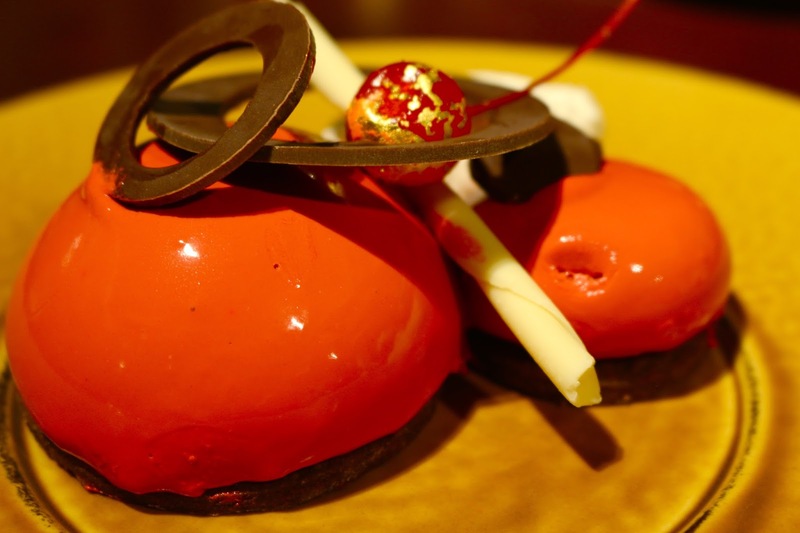 Every dessert we tried also stood apart from any other restaurants. For instance, the Molten Lava Cake is ooey-gooey like you want it to be, but has a nice surprise with the gingersnap crumble. The Key Lime Pie Choux au Craquelin is unlike any Key Lime Pie you have had - and more delicious. We also tried two outstanding signature cocktails that are different than those offered at any other restaurant: Hendricks Pink Fern Gin and Silver Basil - sort of like a margarita, infused with basil. While the atmosphere inside the restaurant is outstanding, many travelers through the airport dine at the eatery for the incredible view. It is so fun - for kids and adults alike - to watch planes arriving and departing. And when there is a launch from Cape Canaveral, you can see that, too! Before our next flight, we plan to forgo the fast food options in the main terminals and relax with outstanding food, wine and cocktails at Hemisphere. See our complete photo gallery on Facebook. If Mount Dora's charming shops and spectacular lake background are not enough reason for you to visit this town, I have discovered a restaurant that will make Mount Dora become a destination for you and your family. 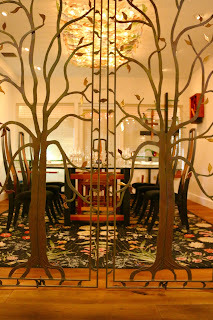 My husband and I had a completely unique, memorable experience at 1921 by Norma Van Aken. We started out at the restaurant's partner across the street, the Modernism Museum - a visit that I would highly recommend. Once you immerse yourself in the art, history and culture of the works at this museum, you have a greater understanding of the philosophy and modern wood and metal decor featured throughout the restaurant - including the authentic chairs and tables that are used. In addition to gorgeous art pieces scattered throughout, the stunning drapes in one of the dining rooms really help you feel the drama and "Old World" American feel of the eatery. 1921 by Norman Van Aken's cuisine is equally as dramatic and unique - and I mean that in a very good way. 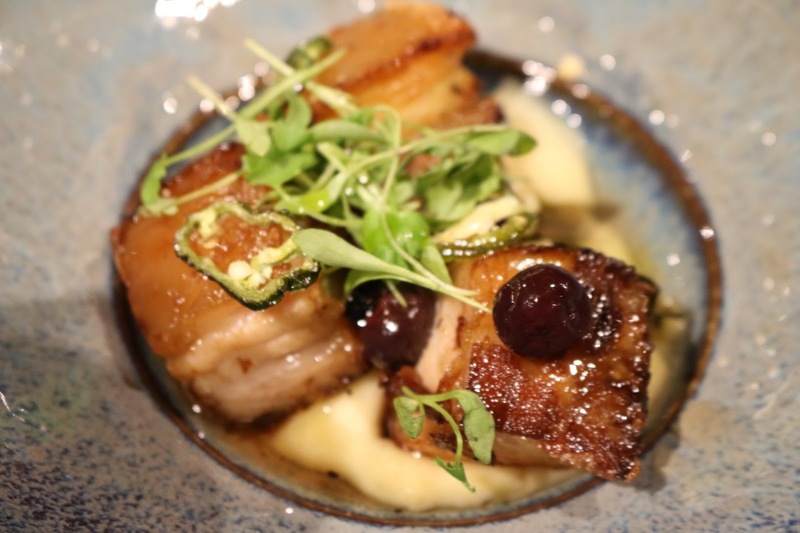 Chef Van Aken, also the founder of Norman's at Ritz Carlton, is lauded as the founder of "New World" cuisine, a celebration of Latin, Caribbean, African Asian and American flavors. 1921's dishes feature some of these flavors, but with more of a modern Florida and local seafood focus. In fact, the restaurant uses only Florida, sustainable seafood - including some lesser-known species that are very tasty. Kudos to Chef Van Aken for keeping Florida fishermen working, while providing outstanding meals and atmosphere to guests. I would highly recommend 1921 to anyone - especially for a special occasion like an anniversary or birthday party. With the high level of service here, you will definitely feel special and pampered. We started with a Roasted Beet Salad with burrata, toasted sunflower seeds and a citrus-vanilla vinaigrette. The burrata mozarella provided a nice creaminess against the golden and red beets and the crunch of sunflower seeds. We paired this dish with a Muga 2015 rose wine - a wine which we really enjoyed and paired perfectly with this dish. For snacks and starters, you also need to try the Conch Fritters and the Spiny Lobster & Rock Shrimp Dumplings. 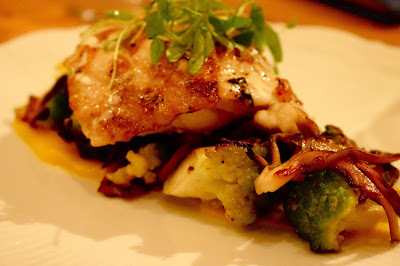 Next, we feasted on Cape Canaveral Wreckfish over a Charred Zellwood corn puree with potatoes, mussels, chorizo and sauce mer noir, as well as the Ponce Inlet Golden Tilefish in a coconut curry sauce with conch fritter, charred pineapple and acorn squash. In both dishes, the fish was absolutely cooked perfectly. The wreckfish was seasoned simply with salt and pepper. With the tilefish, the coconut curry sauce was so light, it did not detract from the flavor of the fish; instead, it added to the complete meal. For dessert, we would highly recommend the Zellwood Corn Panna Cotta, with popcorn tuile and maple crumble. The crunchy maple crumble was the perfect texture to mix with the smooth panna cotta. And a cookie made from popcorn: what a revelation! The restaurant just started serving Sunday brunch, and I will definitely be back for that. Among the unique and delicious brunch dishes: S'Mores Doughnuts with Chocolate & Fluff Sauces, 'Korea Town' Chicken & Waffles with Asian Spiced Syrup and Smoked Brisket Hash with Confit Potatoes, Pickled Sweetie Drop Peppers, Thyme & Vinaigrette & a Poached Farm Egg. The Orlando restaurant industry always helps others in a time of crisis (remember them offering free meals and water following the Pulse shooting?). Now, they - along with outstanding retailers - are doing something nice for active military and veterans on Veteran's Day, November 11. 1. Publix stores - 10 percent off the grocery bill for military personnel and veterans. 2. Walgreens: 20% for active military, veterans and their families. 3. Twin Peaks in Altamonte Springs: a free entree from a special menu for service members. 4. Tijuana Flats: Free entree. 5. Krispy Kreme: Free coffee and a doughnut. Yum! 6. Applebee's: Free entree from a special menu plus $5 off coupon to use on a future visit. 7. Restaurant Ash: Free soup with purchase. 8. Red Robin Gourmet Burgers: Free Red's Tavern Double Burger and Bottomless Steak Fries. 9. BJ's Restaurant & Brewhouse: Free meal under $12.95. 10. 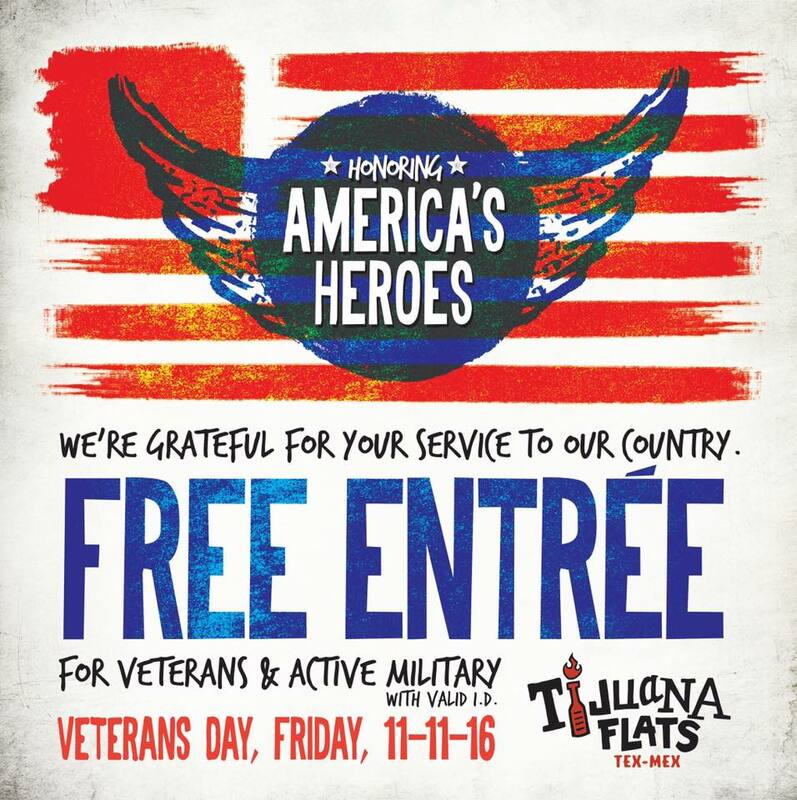 Texas Roadhouse: Free lunch from a special menu for active military, former military and veterans. If you know of other great restaurant and retail deals for veterans, please post them in the comments below! Election Day Restaurant Deals in Orlando, U.S. I love when restaurants and bars make the process of voting so much more fun. Whoever wins the presidential election this year, we should at least go out and celebrate the fact that we took part in the process with food and drinks, right? 1. $1 burgers all day at Restaurant Ash. Yes, if you come in with your "I Voted" sticker, you can get a grilled burger and side salad for only $1. Plus, enter to win other prizes. This is a great promotion from a restaurant that serves craft sandwiches and other yummy fare. 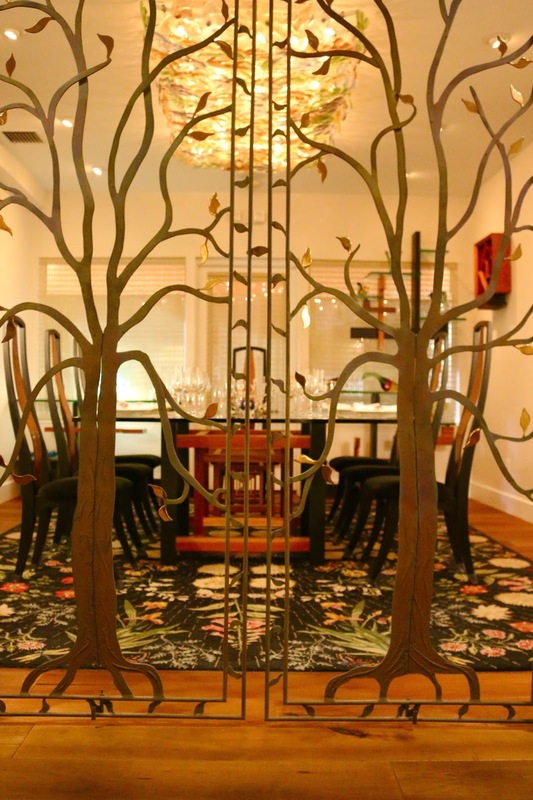 The chef/ owner of this fabulous location is Ashley Nickell of Hell's Kitchen fame. 2. Free drinks from 9 p.m. to 10 p.m. when you show your "I Voted" sticker during Southern Nights' viewing party. Doors open at 9 p.m.
3. Free doughnut at Krispy Kreme locations all day when you show your "I voted" sticker. 4. Free cup of coffee at participating 7-Eleven stores. The catch? You have to use their mobile app. 5. 30% off your order at Bob Evans. 6. Free cookie at Great American Cookie when you show your "I voted" sticker. I am actually surprised not to see more local, independent restaurant deals on Election Day. If I have missed any, please comment below! There are many more than 10 delicious dishes to enjoy at the 2016 Epcot International Food & Wine Festival - not to mention all the lovely wine and cocktails - but we wanted to give you a quick list of items that you should not miss when you go this year. Hurry, though - the Festival only lasts through November 14! 1. Loaded Mac 'n' Cheese at Farm Fresh. This was our favorite "comfort food", and we loved the addition of pepper bacon and peppers! 2. Buttered Chicken with Micro Cilantro and Naan Bread in Africa. One of our favorites last year, too, we loved the flavor of this dish, and it was fairly filling, making it more of a value than some of the other dishes. 3. Artist Palette of Wine and Cheese at Wine & Dine. 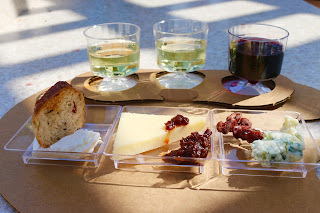 At $11 for three delicious wines, along with small cheese and bread tastings, this was a pretty good deal and we enjoyed trying new flavors. If you like blue cheese, you will love the blue cheese with walnuts! 4, Sweet and Spicy Shrimp in Australia. This is the dish we thought of if you want to be adventurous and try something new. The flavors were spot on, and the pineapple and snap peas in the dish were cooked just right and very scrumptious. 5. 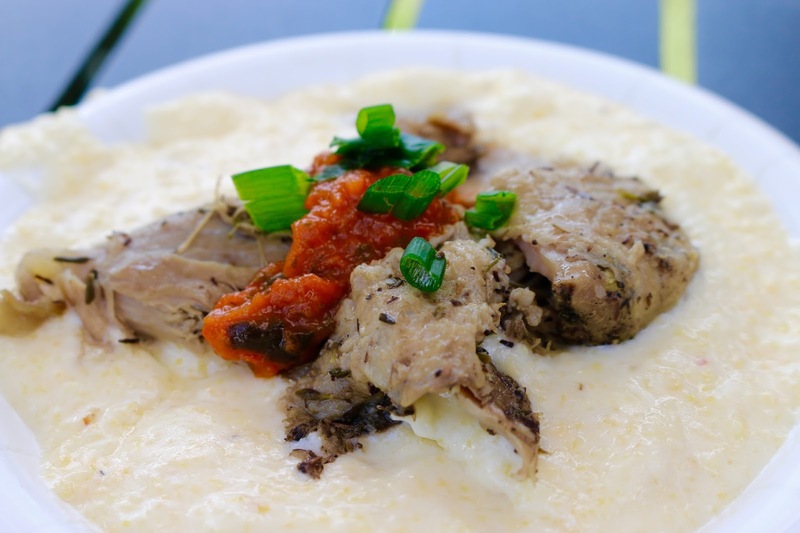 Duck Confit with Creamy Polenta and Fire-Roasted Salsa at new pavilion The Greenhouse Guru. The duck was tender and delicious and made a perfect, flavorful bite with the polenta and fresh salsa. 6. Boeuf Bourguignon, Cabernet-braised beef short ribs with mashed potatoes, in France. The beef had sort of a pot roast texture, and the sauce was delicious. 7. Le Cellier Wild Mushroom Beef Filet Mignon with Truffle-Butter Sauce at Canada. We get this every year. The filet is outstanding and the wild mushrooms had such flavor! 8. Roasted Verlasso Salmon with Quinoa Salad and Arugula Chimichurri in Patagonia. The salmon was tender and delicious and that chimichurri sauce is everything! 9. Liquid Nitro Chocolate-Almond Truffle with Warm Whiskey-Caramel and Ghiradelli Chocolate Raspberry Torte at Chocolate Studio. I did not try these desserts myself, but were told both were a perfect way to end an evening at the Food & Wine Festival! 10. Chocolate Baklava in Morocco. 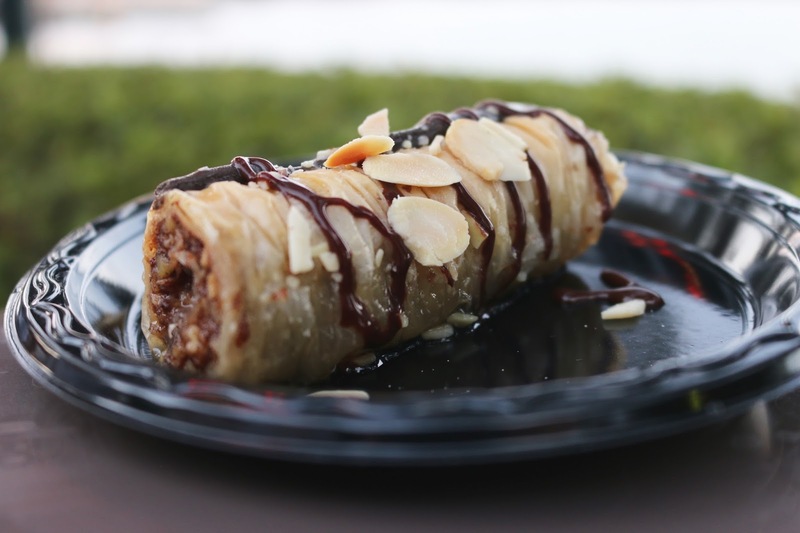 The inside was a little weird tasting, but the dark chocolate and crispy phyllo dough make this dessert worth trying!